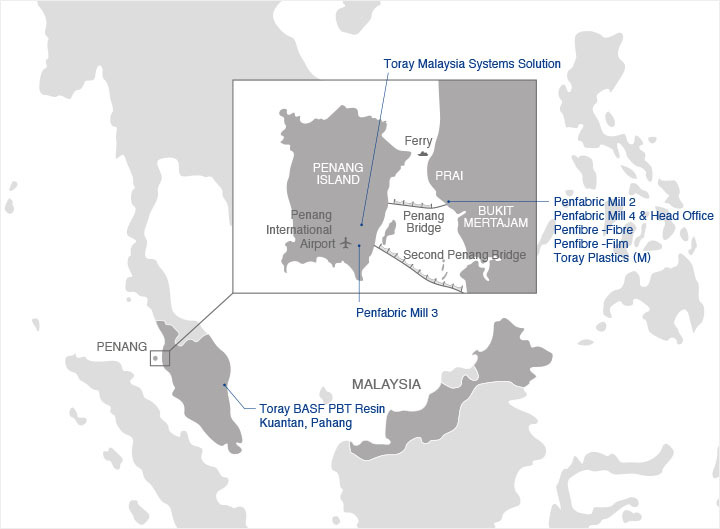 Supervision and Administration of Toray's business operations in Malaysia. Plot 117-119 & 200-202, Prai Free Industrial Zone 1, 13600 Prai, Penang, Malaysia. Manufacturing of polyester staple fibre, manufacturing of Polythylene Terephthalate(PET) Films marketed under the trademark "Lumirror" and metalized films, slitting and supply of battery separator films under the trademark "SETELA™". Lot 109-114, Prai Free Industrial Zone 1, 13600 Prai, Penang, Malaysia. Lot 128-130, Prai Free Industrial Zone 1, 13600 Prai, Penang, Malaysia. 150-A, Blk A, MK. 12, Phase 3, Bayan Lepas Free Industrial Zone, 11900 Penang, Malaysia. Manufacturing of woven fabrics of pure cotton, polyester and blends of polyester/cotton, polyester/organic cotton, recycled polyester/cotton, recycled polyester/organic cotton, cotton/nylon and Cordura, with and without elastane, white, piece-dyed, yarn-dyed, printed (using pigments, reactive and disperse dyes) and other finishes. 100-E, Blk C, MK. 12, Phase 3, Bayan Lepas Free Industrial Zone, 11900 Penang, Malaysia. Plot 1 & 2, Prai Wharf Free Industrial Zone, 13600 Prai, Penang, Malaysia. Manufacturing and Marketing of ABS Resin, Marketing of PBT Resin. 2628, MK. 1, SPT. Lorong Perusahaan 4, Prai Free Industrial Zone 1, 13600 Prai, Penang, Malaysia. Production of polybutyleneterephthalate neat resins. Jalan Gebeng 2/1, Kawasan Perindustrian Gebeng, 26080 Kuantan, Pahang Darul Makmur, Malaysia. Provision of full suite of information technology solutions to support Toray Group business operations ranging from planning, development, installation and operation of information systems, as well as IT consulting and IT research & development according to business needs. 108-B-2-21, 22, 23 & 23A, Setia Spice Canopy, Jalan Tun Dr. Awang, 11900 Bayan Lepas, Pulau Pinang, Malaysia.